Across the world, 3.6 billion people (47% of the global population) were exposed to household air pollution from the use of solid fuels for cooking. In Nepal, the proportion of households using solid cooking fuels in 2017 was 65% (19 million). A child born today will die 20 months sooner, on average, than would be expected in the absence of air pollution. 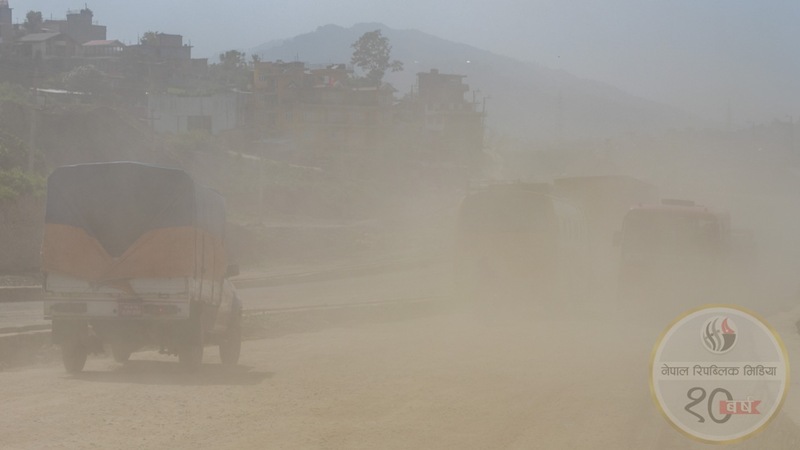 KATHMANDU: Nepal’s air quality is degrading every year, according to the State of Global Air 2019 report by the Boston-headquartered Health Effects Institute. 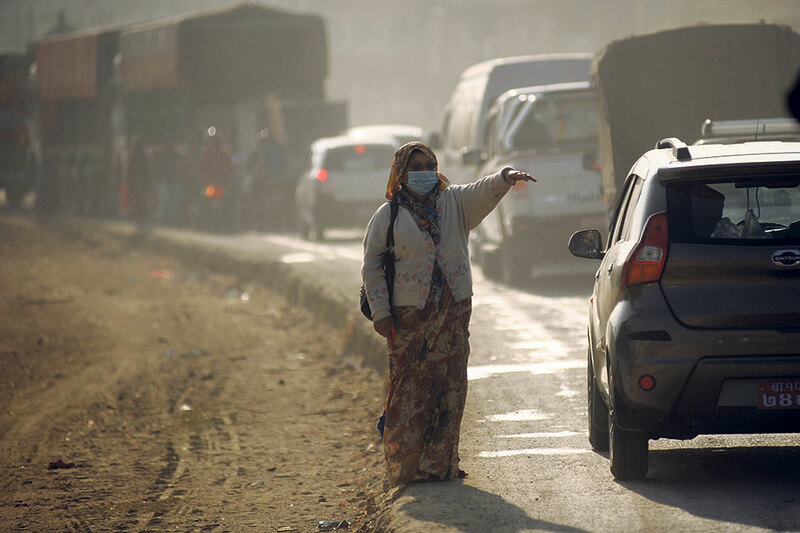 From 2015 to 2017, annual exposure of Nepalis to air pollution increased from 96 µg/m3 to 100 µg/m3. Data shows that while the South Asian region is cutting down emissions, Nepal’s pollution level is soaring. The report states that in 2017, annual PM 2.5 exposure was highest in South Asia, where Nepal (100 µg/m3), India (91 µg/m3), Bangladesh (61 µg/m3), and Pakistan (58 µg/m3) had the highest exposures. Maldives (7.8 µg/m3) had the lowest exposure in the region. PM2.5 (particulate matter with a diameter of less than 2.5 micrometres, can enter the lungs and the bloodstream) exposures were highest in South Asia in 2017. Across the world, 3.6 billion people (47% of the global population) were exposed to household air pollution from the use of solid fuels for cooking. The region with the second-highest PM2.5 exposures was western sub-Saharan Africa: Niger, Cameroon, Nigeria, Chad and Mauritania. The 10 countries with the lowest national PM2.5 exposure levels were the Maldives, the United States, Norway, Estonia, Iceland, Canada, Sweden, New Zealand, Brunei, and Finland. The report highlighted that in 2017, 92% of the world’s population still lived in areas where PM2.5 exceeded the WHO guideline for healthy air; 54% still lived in areas exceeding the WHO’s least-stringent interim target, often by substantial margins. 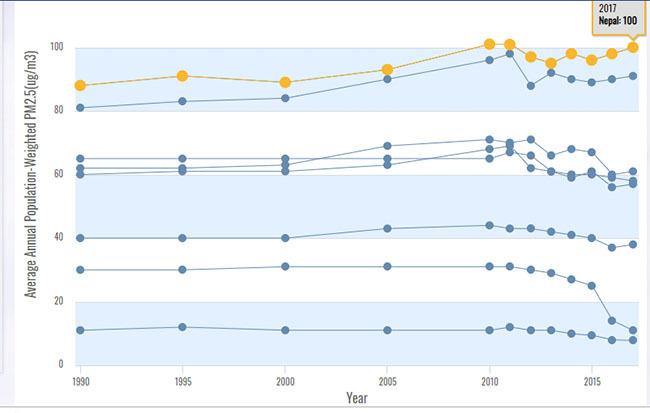 While the sources for PM2.5 pollution varies between countries and regions, in South Asia, major PM2.5 sources include household burning of solid fuels; dust from construction, roads, and other activities; industrial and power plant burning of coal; brick production; transportation; and diesel-powered equipment. Exposures to ambient PM2.5 have reduced life expectancy by an estimated average of 1 years and 7 months in South Asia and 1 year and 3 months in North Africa and the Middle East. The impact on life expectancy in more-developed countries is far lower, about 4½ months on average in the high-income regions of North America and Asia Pacific. “In South Asia, household air pollution contributes to an additional life expectancy loss of about 1 year and 3 months, bringing the total life expectancy loss from air pollution to 2 years and 6 months,” the report reads. In Nepal, the proportion of households using solid cooking fuels in 2017 was 65% (19 million). “This means a child born today will die 20 months sooner, on average, than would be expected in the absence of air pollution,” the report said. Likewise, in sub-Saharan Africa, where more than 80% of people cook with solid fuels, household air pollution dominates the impact on life expectancy, accounting for 1 year and 4 months of the nearly 2 years in life expectancy loss from air pollution overall. Since life expectancy in this region is already the lowest in the world (62.8 years on average), the proportional impact of air pollution is also higher. Air pollution caused the deaths of 2.4 million people, 1.2 million each, in India and China. The two countries topped the list of the 10 countries “with the highest mortality burden attributable to air pollution” in 2017. “Each year, more people die from air pollution-related disease than from road traffic injuries or malaria,” the report said.